This is the chasm I relocate squirrels across in order to speed up their genetic mutations, so that one day they will take over the world and have their revenge. Beware humans, for the squirrels shall inherit the earth! Wonderful image, really glad to see it ribbon, one of my fav's. Congratulations! Nice shivering cold, shot. 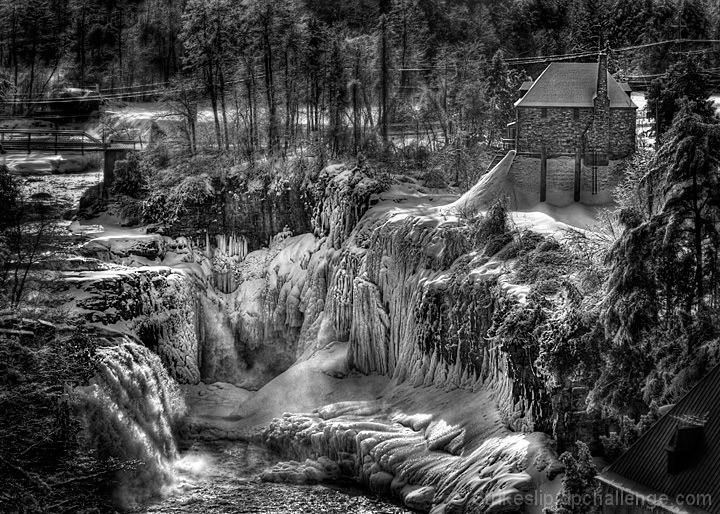 Seems you didn't have to use an ND filter to freeze the falls. I love this one! Good work. Absolutely perfect for the challenge and well presented! awesome work congrats on the ribbon!! Ha, the squirrels YOU cross over will not take over the word. Unknown to you, beneath that icy chasm lies the hidden, lost city of Atlantis; where they preform their own genetic mutations of squirrels. These squirrels look and act like our Earth squirrels, but they in fact have a goal take over and inherit the earth. Now lets talk about what the Bermuda Triangle is brewing...by the way, fantastic picture. =) I would NOT want to fall down there. Great image, congrats Slippy........so are you saying this is just one big squirrel hole? Fantastic shot, congrats on the second place! Wow Slippy. I have got to learn how to do B&W post processing like this. Looks like you had an incredible scene to work with and tweaked it just right. Congrats man. A great win! Another great story in a photo. Another red dude, you love it. Eight ribbons. *checking bible* yep, thats a sign of the apocalypse. Thanks Slippy, you've brought about the end of days. Congrats on another ribbon. This is a great shot. Amazing- What an awesome scene. I didn't get to vote on the complete challenge because of personal obligations but I wish I would had been able to. This would of received another 10. Very impressed with the B&W process, so much detail and range. This has to go into my fav's. Very nice work. IMO probably one of the best B&W photos I have viewed to date. Whoa...this is fantastic!! There is so much to love about this photograph. Beautiful! Well deserved ribbon. This shot is just incredible in so many ways. I love the tone mapping, the composition, the black and white. It just all works here. Congrats on an amazing entry and the beautiful Ribb. Congrats Slippy! I love this! :) Well done! Wow! FABULOUS!!! Congratulations on the "no-brainer-for-a-ribbon" photo!!!! Brilliant image, congrats on your ribbon, Slippy! Wow! What a stunning shot. WTG, Slippy. Congrats on the ribbon. A great BW work, congrats for the red ribbon. Red again....you are the king of the reds....awesome photo! This was by far my fav of the challenge. Congrats on the red. Fantastic shot!!! Congrats on your well deserved ribbon Slippy! Great place, and wonderful shot of it. Way to go Slippy. Watch out for the tree rats. I wondered where you really tossed those squirrels! Congrats! Heh. Congrats on another red, Slip! Was a fav during, and once again after the challenge. Guess I'll have to log in under my troll account to fav it again. Congrats on another red Slippy. I'll buy. Beautiful capture. I think the B&W conversion is fantastic. Great job with this shot. Wow, I can still sense all the motion of rushing water!! Oh wow. That's really awesome. But I think there maybe so much going on here that come color may help differentiate between all of the elements in the frame. WOW, really nice. Is it HDR in B/W? If it is I have to admit I have not seen many HDR in B/W. I really like this one, my pick for ribbon. Good luck. Blimey, I have never seen anything like this! Fascinating. Fantastic. B&W conversion worked well with high contrast result. This shot has an almost fairy tale feel to it---the dark forest kind!! Looks like a ribbon to me, great shot. 8. Proudly hosted by Sargasso Networks. Current Server Time: 04/18/2019 04:21:03 PM EDT.